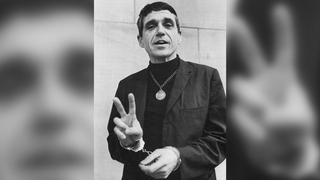 Part 2: Family and Friends Remember Father Daniel Berrigan, Legendary Antiwar Priest & Poet | Democracy Now! niece of Daniel Berrigan, and a longtime peace activist. She writes a regular column for Waging Nonviolence. professor and director of the Stuart H. Smith Law Clinic and Center for Social Justice, as well as the Gillis Long Poverty Law Center at Loyola University. He was one of Daniel Berrigan’s attorneys. FATHER JOHN DEAR: Thank you, Amy. You know, we’re talking about Dan as this great resister. But, you know, he was famous in the early '60s as a poet, so he was a—he was actually a great literary person, as well, I think one of the great poets of the time. And he was also a very serious religious leader as a Catholic priest. And so, Dan entered the Jesuits in 1939. He and his family were very much pro-war. In the ’50s, Dan is very involved in the church and is a teacher. What happened—and I pressed Phil on this, and Dan later—is that the FOR reached out to him around 1960, and to Thomas Merton and to Thich Nhat Hanh, and got them really involved—the Fellowship of Reconciliation—in beginning to speak out against war and nuclear weapons. And then they went through this transformation, with Thomas Merton, kind of under the guide of Dorothy Day, Dan's great friend, and she was really Dan’s leader, if you will. And Dan was in Europe in 1964. AMY GOODMAN: That was Michael Moore. And I want to end with Father Dan Berrigan in his own words, reading a poem about his brother, Phil Berrigan. into the cave of storms, past the storms. Herod screams like a souped-up record. They toss it back, harmless. of the jeweled fish, all but taken. AMY GOODMAN: That was Father Dan Berrigan. He died on Saturday at the age of 94. I want to thank our guests, Frida Berrigan, John Dear, both in New York, and Bill Quigley, here in New Orleans with me. That does it for our show. We will link to all our interviews with Dan Berrigan over the years at democracynow.org. Special thanks to Mike Burke, Jeremy Scahill, Denis Moynihan, the whole team at Democracy Now!, Brendan Allen, Renée Feltz, Nermeen Shaikh, Deena Guzder, Carla Wills, everyone who made this broadcast possible, as well as Amy Littlefield and Sam Alcoff and Laura Gottesdiener. I’m Amy Goodman. This is Democracy Now!